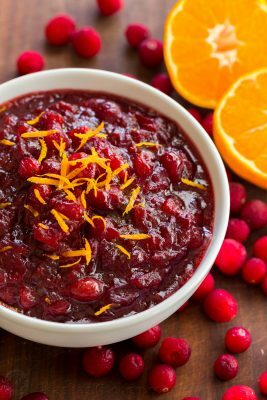 This cranberry sauce is infused with orange and cinnamon and sweetened with honey. Cranberry relish bursting with bites of sweet, tangy cranberries. Store-bought is no match for homemade cranberry sauce! In a medium saucepan, combine 2/3 cup honey, 1/4 cup water, 1/4 cup orange juice, 1 tsp zest and 1 cinnamon stick. Bring to a simmer over medium heat, stirring to dissolve honey. Add 12 oz cranberries and bring to a boil. Once boiling, adjust heat to keep at a low boil and cook 10 minutes uncovered, stirring occasionally. Cranberries will burst and sauce will begin to thicken. A minute or so before turning off the heat, taste for sweetness and add more honey to taste for a sweeter sauce. Keep in mind the sauce will thicken when it cools. Remove from heat, discard cinnamon stick and cool cranberry sauce to room temperature then refrigerate until ready to serve. *Zest the orange before juicing it (it's much easier!). Be sure you only zest the orange peel and not the white portion which can make the sauce bitter.